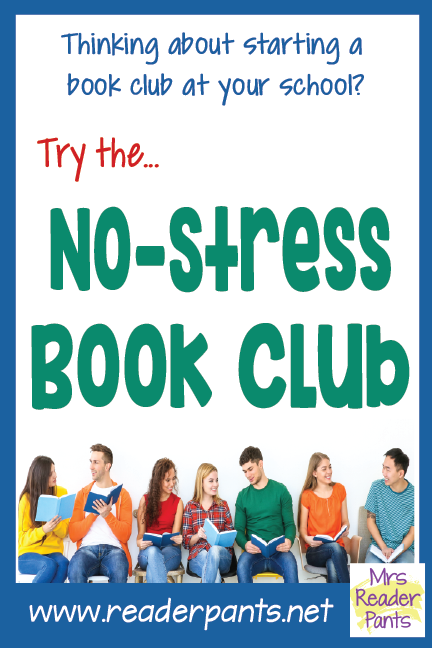 I am positive I've written about the No-Stress Book Club before, but I cannot find it anywhere on my blog. Perhaps I wrote it for the school newsletter or LM_Net or something else? In any case, it would have been years since I wrote about it, so it needs an update anyway. Do you have a book club in your library? You probably do, and if you don't, maybe this post will inspire you to start one. I've done many book clubs over the years, for students and for teachers and sometimes for both together. 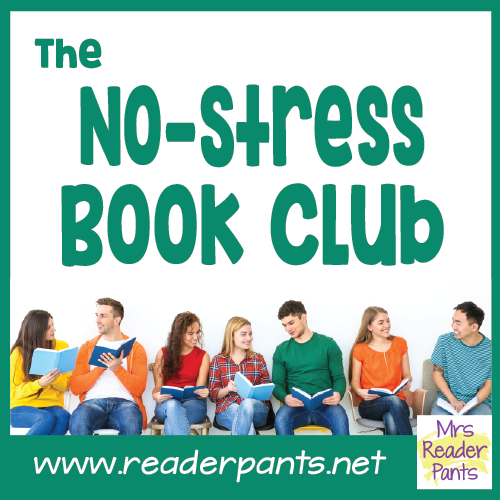 This post is about problems I've encountered with running book clubs and how I've resolved those issues with the No-Stress Book Club. In my mind, the "No-Stress" part really means no-stress for me, but don't tell the students that! It's no-stress for them as well. Win-win! How will the book/s be selected? Should I try to get copies for everyone who joins, and if so, how can I pay for it? How can I engage reluctant readers? Should I do a "one book, one school" book club? Should I read the book aloud? Or should students be expected to read the book on their own? Should I assign chapters? What activities can we do that promote discussion of the book and deepen students' understanding? How can I encourage students to attend regularly? How can I ensure we have enough time for the club meetings? I've had all these questions myself, especially when I do a book club where I read the entire book aloud. I would order 30 copies of the book, usually with Scholastic points or book fair dollars, and the students could read along while I read out loud. This format was somewhat popular with my students (it helped that I brought breakfast), but it was very Mrs. Collazo-centric. Mrs. Collazo chose the book. Mrs. Collazo brought breakfast. Mrs. Collazo read aloud. Mrs. Collazo led the discussions. All on me. If I needed to be absent, it was canceled. Because I was the only one reading, I got sick of hearing my own voice. When I tried turning the read-aloud over to students, they complain that I read "better" and that they just want me to read. Sigh. Many schools are doing the popular "One book, one school" reading clubs. I can't speak to those because I've never done one. What I will say is that while I used to choose one book for our book club to read together, I no longer do that. The first big problem was with acquiring enough copies for every student. Considering my limited budget, I didn't want to spend a large amount of money on many copies of one book. I'd rather purchase 30 different titles than 30 of the same title. To mitigate this, I used Scholastic dollars or points to purchase my club books, but that limited me to what was available from Scholastic. A huge selection, sure, but still limited. I also could only purchase books that I could "afford" to buy with points or Scholastic dollars. Secondly, no matter what book I chose, there would be people in the club who just didn't love it. Maybe it was too hard, or too easy. Maybe it wasn't something they could relate to. Maybe I chose a book because of the large number of sixth graders who attend, but the three eighth graders stopped coming because the book was too young for them. The third issue with one-book clubs was the fact that some students just did not (or could not) attend regularly. They might be there for Chapter 1 and not return until Chapter 6. Having missed so much of the plot, these students may drop out of the club entirely. Assigning chapters to read at home didn't work, either, and let's not forget that students are doing this for fun, not as a homework assignment. Tired of these issues, I started a No-Stress Book Club, and I've done a version of it every year since. It works really well and, best of all, it requires almost no planning on my part. At the heart of the No-Stress Book Club is the fact that members read and talk about whatever books they want to. It could be a book they just started reading, or one they read years ago and loved. Everyone reads at their own level, their own pace, and within their own interests. During the club meetings, we simply talk about it. And it's perfectly okay if a student doesn't want to talk; they can come just to listen, too. I am a member of the club, just like the students. Teachers can also join the group, or you could do a separate teacher group with the same format. I think it is the perfect book club format because it is easy, easy, easy! Plus, everyone in the group has equal say and responsibility to keep it going. Oh, and everyone who wants to bring food, does, either for themselves or to share. And, if a student misses a meeting or two or randomly decides to join, they are not totally lost. Each week's meeting starts and ends with that week; there are no missed plot points or questions about which book we are reading now. I love it! Pick a time to meet. My student group meets during lunch, and we eat in the library. Before and after school groups also work well, depending on your schedule. My teacher group (brand-new at my current school) meets after school. During the club, one person volunteers to go first. That person tells us about what he/she is currently reading. They should not talk for more than a few minutes, and spoilers are not allowed. They tell the group how it's going, if they like the book right now or if they don't like it right now. Is it interesting? Slow? Don't like a character or plot thread? This is what we want to hear about. Summaries are to be kept brief to avoid unintentional spoilers. When that person finishes, someone else volunteers to tell about his/her book. I never, ever lack volunteers. In fact, most of the time, we have to stop before everyone has gotten a chance to go. That's it! Everyone reads whatever book they want to, at their own pace. If they decide the book isn't for them, they can abandon it. This isn't a book club where everyone reads the same book. We all read whatever we want, just the way it should be! I've done this format with teachers, too! I just did a No-Stress Book Club with a group of sixteen--sixteen!--teachers, and for the first time, I asked the teachers to email me their book choices before our meeting. I compiled these into a PowerPoint (included below) so we could see the book covers. Everyone brought a snack to share, and I sent the PowerPoint to the teachers afterwards so they had the full list. At a previous school, I sponsored a student-run book club (an 11th grader did it for her CAS community service project). I loved this club especially because I was just another member of the group since the student was the facilitator. The student facilitator (we'll call her Ella) had a cool idea for it that I really loved. She did a theme each week. The students in the club nominated different themes on little slips of paper at the beginning of the club. If they thought of a new theme, they could add it to the bowl at any time. Each week, Ella drew a paper from a bowl to see what the next week's theme would be. Themes included: humor, dystopia, blue covers, annoying characters, etc. I remember one theme--plays--was not very popular among the members the week we had to discuss those. The books discussed could be current reads, books read specifically to fit the theme, or books they read in the past; the members did not have to read them that week. I talked about The Crucible, which I hadn't read since high school and had to review before I could talk about it. You will likely have more students who want to talk than time allows. Ask students to volunteer to facilitate the meetings and call on volunteers. Alternately, one student could use "The Hat" app to choose the next speaker. Students could always "pass" if they just want to listen and not share that day. No-stress, remember? I do allow students to eat in my library, which really helps drive attendance. If you feed them, they will come! Encourage students to bring food to share. Many enjoy baking and will love showing off their skills. Just make sure they adhere to any nut-free rules your school probably has. Above all, take yourself out of the facilitator role as much as possible. Get the ball rolling, then start turning things over to students to run. You are very busy and may not always be available to make sure things go smoothly. You will be absent eventually. The students won't be at your school forever, and you won't be there forever, either. Give them the knowledge and power to start a No-Stress Book Club, no matter where they are. If they can run it at your school, they can run it anywhere. How do you do book clubs in your school? Have you tried "One book, one school"? That's what I have - only I hadn't thought to call it 'The No-Stress Book Club'. The difference is I have made it grade specific so the readers are a similar age and sort of similar reading level. I found that when I mixed up Gr 9s and 8s, the 9s felt the 8s were too young - ageist much?! This year I just had 7 gr 8 girls (that's the way it worked out) and it's been a blast! They all swear they want to continue next year. The only thing I don't do is make them facilitator - I like that! We keep a record of our reading in a book - each member has a couple of pages and we add their latest reads and they rate them, for anyone else wanting to try the books. I like your powerpoint idea. I do try to not be the teacher, rather just an older member. I wonder if our teachers would like this - they will probably like the idea but they are super busy every minute of every day. But I'll ask! Thanks, I love your blog and suggestions, I don't know how you manage it all! Yes, a great idea to separate by grade level. I love the idea of recording what books you read, too. That would be helpful for students who wanted to read a book someone else recommended but could not remember. I often look up previous booktalk PowerPoints to see what book a student is asking me for. For larger book clubs that might all be reading the same book, don't forget to reach out to the public librarians. I work in the public library and collaborate with the school district's 3-5 grade librarian to make sure we get as many copies as possible of the book the kids are reading. I've got the reach of 62 libraries within my system so together we can get many, many copies of high-demand books to eager readers -- for free. Great suggestion, Amy! I am a huge user of public libraries also--I'm not sure how I would function as an expat without my Brooklyn Public Library OverDrive account! Even here in Shanghai, the international schools have a working relationship with our Shanghai Public Library. A little different here since most of their books are in Chinese, but they do allow our students to use their databases (many in English!) and checkout books. Thanks for the suggested link--I added it to the post. Do you need your colleague's approval to start a book club? Couldn't you just start one on your own? Even if it's just with the teachers? I did/am starting a staff one. I'm super excited! I didn't need approval, just motivation and time. And I participate in the student one when I can, but the sponsor gets the final say on how she runs it. Great ideas. I have been wanting to start a book club and this popped up!I cannot seem to play the power point. I just relinked the PowerPoint, so maybe that will help. I wasn't able to open it on my phone, either, but when I clicked the link underneath it, I could pull it up on SlideShare. I also checked to make sure it is public and downloadable from SlideShare, and it is. Some great book suggestions from my teachers!